Did you know your printer has a limit on the number of pages it can possibly print? Written for printer purchasers and users. If you spend a fair amount on printer cartridges, you should read the UK Daily Mail's recent article on 'The great printer rip off: Ink costs more than vintage champers - and devious new tricks mean you constantly have to buy refills'. This article reveals that printer manufacturers make it as hard as possible for you to have competing choices when purchasing cartridges. They also deploy a range of tricks to make you use ink faster than you need to. I took it to a licensed service provider who informed me that most printers track the number of pages printed. 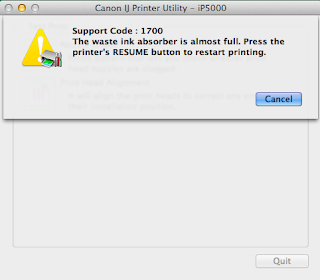 Once a page limit is reached, your printer displays an error message and you will be unable to print. They advised that this can be fixed by replacing the printer's main board, but warned that this only has a 50% chance of working. After authorizing this, the error message disappeared and I could print again... for a brief while until the print quality become erratic and several varieties of error message were displayed. The service provider informed that although my print head required replacement, this was impossible as that part was no longer in production. As a result, I was given a newer refurbished model for free after my "old" one was recycled. I would like my printer to work until it literally 'falls apart' and wonder whether there is any printer manufacturer which produces a printer that; is designed to last longer than five years, has no limits on printable pages and a reliable supply of spares? (If you know, please let my readers know in the comment box below, thanks!) Given the growing market for environmentally responsible products, there could be a market niche for such a green printer.